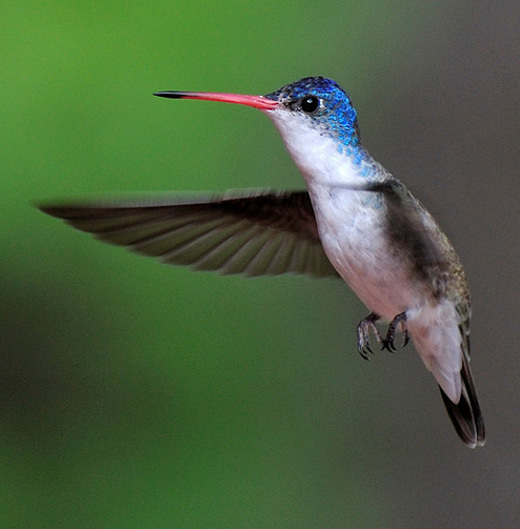 Violet-crowned Hummingbird: Breeds in southeastern Arizona and southwestern New Mexico. Spends winters in Mexico. Preferred habitats include canyons and streamside growth. The Violet-crowned Hummingbird bird is the only American hummingbird lacking a brightly colored gorget. This hummingbird is commonly found in stands of sycamore and cottonwood trees along streams in desert canyons. A group of hummingbirds has many collective nouns, including a “bouquet", "glittering", "hover", "shimmer", and "tune” of hummingbirds.